Oil-rich Angola is holding its first national census since 1970 - when the country was still a Portuguese colony. More than 90,000 officials have been deployed across the country, which is recovering from 27 years of war. The process is reported to have started smoothly in the capital, Luanda. Following fears that criminals could impersonate census officials to gain entry to people's homes, residents have been urged to be wary about opening their doors. 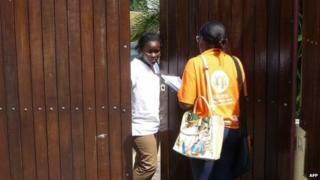 Angola's National Statistics Institute director Camilo Ceita also said that no census-taker would knock on their doors at night to collect data. Officials hope that having accurate information about the population will help the government improve its planning and provision of services. The BBC's Zenaida Machado says a team of census officials has gone to the airport to collect information from travellers who are going away for the next two weeks, while the survey is being carried out. The authorities say the long conflict and "other post-war priorities" - which our reporter says could have included securing the peace and improving the infrastructure - have made it impossible for the census to take place before now. The process is estimated to cost about $200m (£120m). The World Bank estimates that Angola's population at about 21 million. When the last census was carried out in 1970, the population was around six million. The results of the present count are expected in several months' time. Angola is Africa's second biggest oil producer. It has a small number of extremely wealthy people but most of its people live in poverty.